The nats (နတ်‌; MLCTS: nat; IPA: [naʔ]) are spirits worshipped in Burma (or Myanmar) in conjunction with Buddhism. They are divided between the 37 Great Nats and all the rest (i.e., spirits of trees, water, etc.). 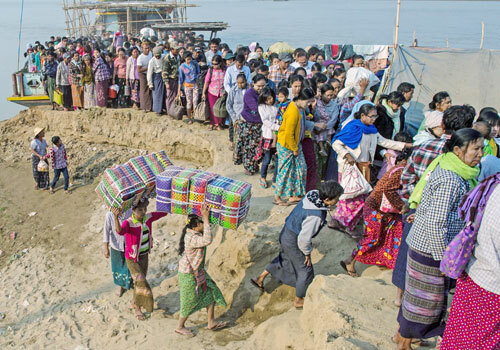 Almost all of the 37 Great Nats were human beings who met violent deaths (စိမ်းသေ, lit. “green death”). They may thus also be called nat sein (နတ်စိမ်း; lit. green spirits). The word ‘sein’, while meaning ‘green’, is being used to mean ‘raw’ in this context. There are however two types of nats in Burmese Buddhist belief. Nat spirits are termed lower nats or auk nats (အောက်နတ်), whether named or unnamed, whereas ahtet nats (အထက်နတ်) or higher nat dewas inhabit the six heavens. Much like sainthood, nats can be designated for a variety of reasons, including those only known in certain regions in Burma. Nat worship is less common in urban areas than in rural areas, and is practised among ethnic minorities as well as in the mainstream Bamar society. It is however among the Buddhist Bamar that the most highly developed form of ceremony and ritual is seen. Every Burmese village has a nat sin (နတ်စင်) which essentially serves as a shrine to the village guardian nat called the ywa saung nat (ရွာစောင့်နတ်). An offertory coconut (နတ်အုန်းသီး) is often hung on the main southeast post (ဥရူတိုင်) in the house, wearing a gaung baung (headdress) and surrounded by perfume, as an offering to the Min Mahagiri (Lord of the Great Mountain), also known as the ein dwin (အိမ်တွင်းနတ်) or ein saung (အိမ်စောင့်နတ်) (house guardian) nat. One may inherit a certain member or in some instances two of the 37 Nats as mi hsaing hpa hsaing (မိဆိုင်ဖဆိုင်; lit. mother’s side, father’s side) from one or both parents’ side to worship depending on where their families originally come from. One also has a personal guardian spirit called ko saung nat (ကိုယ်စောင့်နတ်). The medium spins around in a frenzy of red and gold while glugging from a bottle of whisky, part of an age old ritual to honour Myanmar’s spirit guardian of drunkards and gamblers. 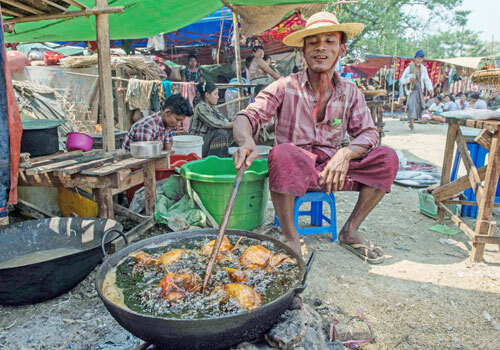 Every year thousands of people pour into a small village southwest of Mandalay for a two-week festival, many packed into boats clutching bags of food and bedding or pulling up on rickety old bullock carts. 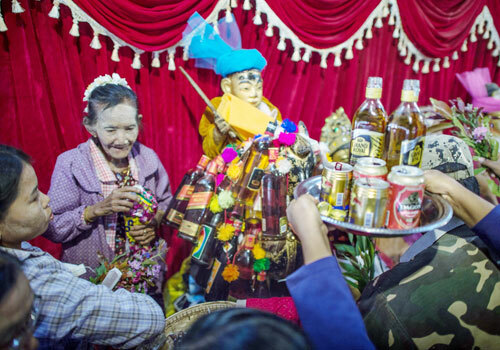 The event honours Ko Gyi Kyaw, one of Myanmar’s best-loved 37 “Nat” spirits and is known for his penchant for booze, dancing and cockfights. “He is the unrivalled Nat and the king of Nats, the master of Nats,” said prominent medium San Hlaing Tun, his huge diamond and ruby rings glinting. 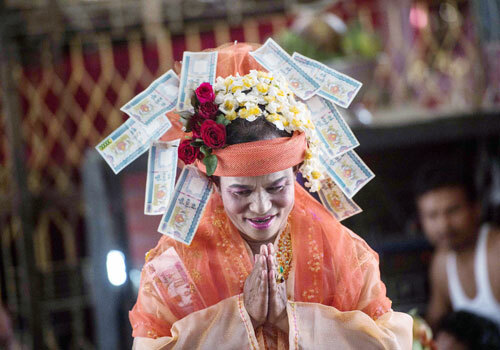 Most people in Myanmar are piously Buddhist, but many in this hugely superstitious nation turn to mischievous local deities for help with everything from business deals to car engines. Each day of the two-week festival worshippers hold different events to honour Ko Gyi Kyaw, from bathing and gilding his statue to raucous cockfights. Beggars dressed up as Nats and clutching wooden bowls line the road seeking donations from the devotees. Dozens of stalls sell his favourite food – roast chicken – to help sober up followers who over-indulged in their whisky-fuelled worship. 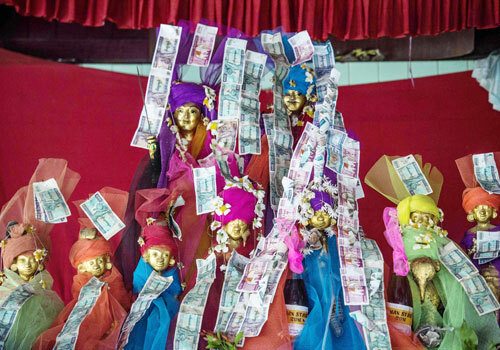 Others flock to small pop-up shrines dotted around the village to make offerings of flowers and bananas, while the rich throw handfuls of money into the air. Inside one small hut medium Naing Naing sits dressed as Ko Gyi Kyaw in a sparkling red and gold outfit, including a headdress bedecked with pink orchids. “I came here from Yangon to pay respects to the Nat and it was an arduous journey to get here,” he said, his face caked with lipstick and eyeliner. Moments later he leaves his flower-filled grotto to begin the ritual. Standing at the centre of the crowd in one of the shrines he begins to dance clutching Ko Gyi Kyaw’s symbols: a statue of a chicken and a bowl that symbolises a gambling pot. Soon they are discarded in favour of a bottle of whisky, which he glugs and pours into the mouths of his gleeful followers who tuck cash into his hat. But for true believers the festival is about more than just fun and debauchery – it is a chance to improve your fortunes for the future by making merit.